Honoring the Super Bowl LIII winner “New England Patriots". achievements. He is reading at a second grade level and loves to do mental math way higher than his grade level. When he came to our school Liam was struggling with his fine motor skills. His writing was age appropriate, but his brain way ahead. Now Liam’s hand writing is awesome. He is able to write sentences. to work with this young mind. Nature has done its job now nurture has come from us. Students from Lawrence Family Public Academy contributed to three collaborative pieces of artwork to support their community. Art students from across Lawrence Public Schools have been working on animal portraits for the second annual Have a Heart charity art auction. In class Mrs. Naffah’s students learned how the art sold at the auction will help families that don’t have heat in their homes this season as the weather is turning cold. They learned how they would each contribute by working on the artwork. As each class worked on it it would continue to grow and change. Everyone’s small effort would be part of something bigger. Proceeds benefit Debbie’s Treasure Chest in support of gas disaster relief efforts. Also on auction will be painted chairs designed by Lawrence Art Teachers, proceeds to benefit Habitat for Humanity. Ticket sales support the Lawrence High School art scholarship. tour the school and meet all the school staff ; in order that we can work as a team to have successful students. On Saturday April 28 families at LFPA came together for a morning of fitness and nutrition. The morning began with a karate exhibition from US Taekwondo Academy and then students listened to the story Growing Vegetable Soup read by members of Raising A Reader. While parents learned about reading to their students and interacting with the story, students planted tomato, carrot, or green bean seeds. The day ended with some Zumba and a raffle. We want families to realize the importance of exercise and healthy food in their everyday lives. 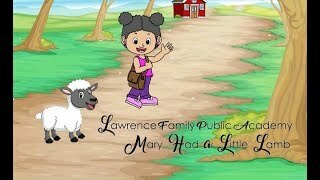 Students at the Lawrence Family Public Academy give us their version of a classic story.